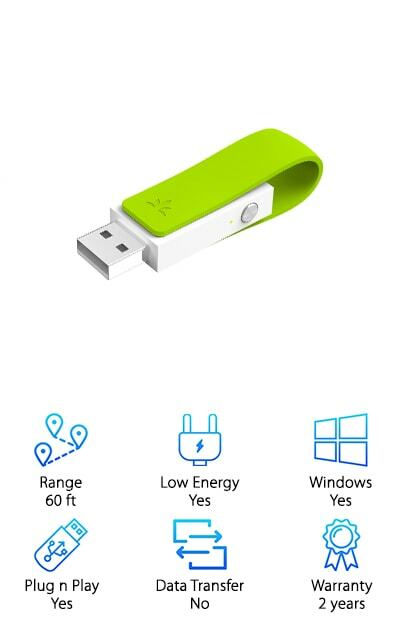 If you want to be able to listen to music remotely or need a way to use your wireless mouse and keyboard with your PC, finding the best USB Bluetooth adapters is the solution. We researched some of the best-selling items and top brands to put together our USB Bluetooth adapter review. But before we get to the must-see items, let’s take a closer look at some of the key features you need to know about when shopping. Range: If you’re going to be using a wireless mouse and keyboard right by your PC, this might not matter much to you. But, if you want to listen to music wirelessly while cleaning at home, it does. Low Energy: Bluetooth 4.0 introduced the awesome Low Energy feature. It puts itself to sleep when not actively being used so it uses less energy and really extends battery life. Sometimes, it extends it by a lot. Supports Windows: All but 1 of our top picks is compatible with Windows. If you’re using an older version of Windows, you may need to install some drivers first. But don’t worry, everything you need is included or easily accessed. Plug n Play: Some of our picks are super easy to use. With newer versions of Windows, you often don’t have to do anything at all. Just plug them into your USB port and they’re all ready to go. 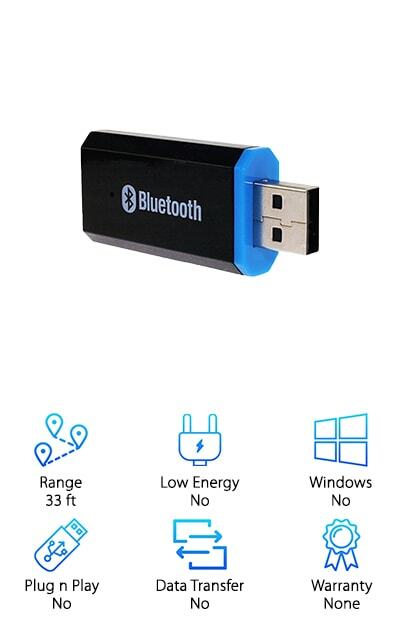 Supports Data Transfer: Some of these adapters allow you to transfer different files, audio, and voice over Bluetooth connection. It’s an awesome extra but not necessary for sound quality. If this is something you want, don’t worry. You’ll find it here. Warranty: It’s always good to have a warranty, especially with a universal USB Bluetooth adapter. You’ll find a little bit of everything here with warranty periods going from 30 days all the way up to 2 years. Now that you’ve learned about the main features in our Bluetooth USB adapter buying guide, you should have some idea of what you need to look for. Let’s move into our reviews. If you’re in a hurry, check out our top and budget picks first. They’ll give you a good idea of the kind of things that are available. Stick around until the end if you can! All of these products are pretty awesome. Okay, let’s get right to our reviews! Our pick for top USB Bluetooth adapter comes from Avantree. One of the reasons we put it at number 1 is because it’s so versatile, it will work for just about anyone no matter what sort of system you have. Why do we say that? It allows you to stream high quality audio to Bluetooth speakers and headphones from your PC, PS4, Macbook, and PC or Linux laptop. And get this, you can switch from on to another without having to pair again. So easy! That’s not all. The low latency technology is perfect for watching movies or playing games in real time. One more thing, it’s a plug and play device, too. You don’t have to install any drivers or anything, just plug it in and you’re ready to go. 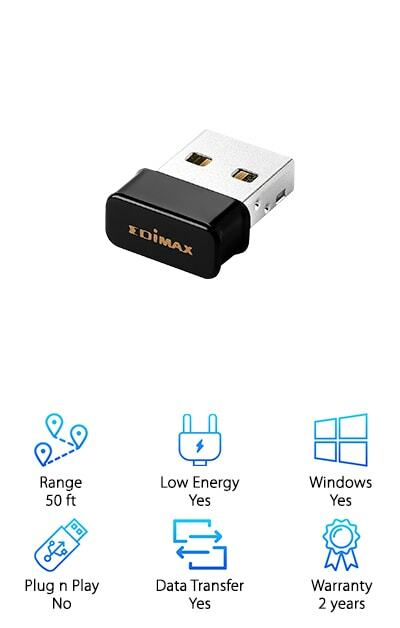 The Edimax Nano USB Adapter is the best Bluetooth adapter for PC if you’re on a budget. This one supports data transfer at up to 150 Mbps. And the Bluetooth is high speed, too, at 24 Mbps. 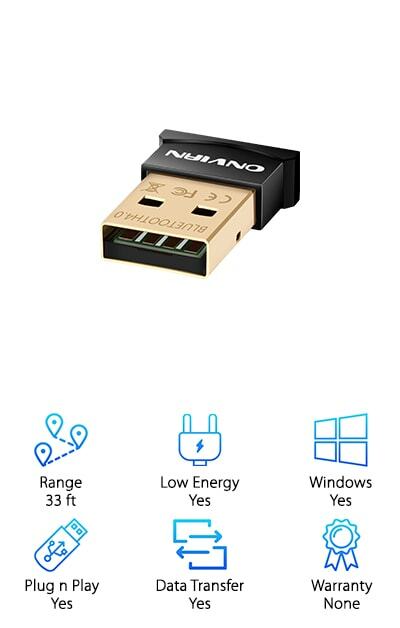 So, not only can you use this as a wifi adapter, you can also connect to most Bluetooth devices, including mice, keyboards, and printers. 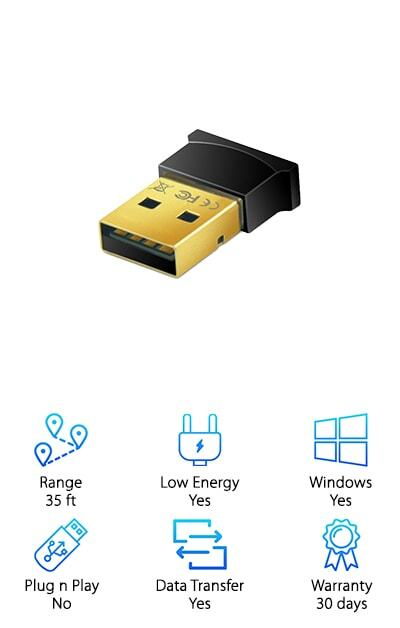 Because it’s one of the newest models with the latest tech, it uses super low power consumption whether you’re connecting to a device or transferring data. One more thing we really liked about it is its size. 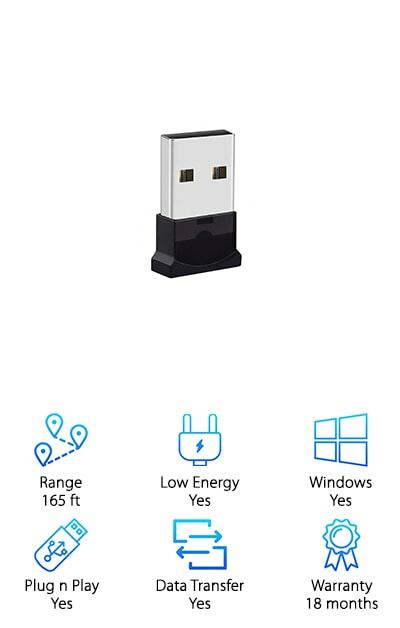 It’s tiny and compact so that it won’t block any other ports when you plug it in. Setup is really simple, too, thanks to the setup wizard that leads you through the process. 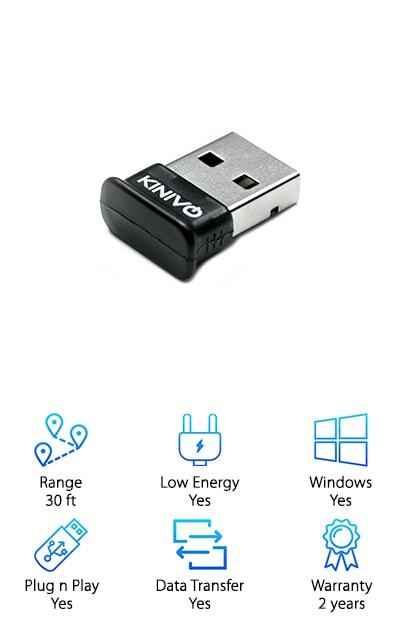 This next best USB Bluetooth dongle is the Kinivo BTD-400 USB Adapter. It’s compatible with a range of different gadgets and supports various versions of Windows, from 10 to 7 to Vista to XP. It will also work with various versions of Linux, including Ubuntu, Mint, and Fedora. So, basically, it’s really versatile. The range is pretty good, too. At 30 feet, you can wear your wireless headphones while you do housework and still be able to listen to music from your laptop. The unit itself is really small and has a low profile when you plug it in. It’s so unobtrusive that you might even forget you’re using it. You’ll still have access to other ports on your computer. Plus, it doesn’t interfere when using a mouse or charging cable. The Plugable USB Bluetooth 4.0 is our pick for best Bluetooth USB 4.0 adapter. What exactly is 4.0? It’s another name for Bluetooth Low Energy. Basically, Bluetooth Low Energy goes to sleep anytime it’s not being used. The end result is that small applications can use a small battery for a really long time. Like, years even. Because the tech is so advanced, you can also use this with things like your Fitbit or iBeacon. This is a really compact adapter that works with Bluetooth accessories like speakers, headphones, mice, and more. It’s compatible with most Windows operating systems and even some versions of Linux, including Ubuntu, Mint, and Raspberry Pi. One more thing, we really like the small size. It’s really small - about the width of a quarter! There’s a lot to love about the CT Costech USB Adapter which is why it made our list for best USB Bluetooth adapter for PC. It works with Bluetooth enabled headphones, cell phone, keyboards, mice, and more. 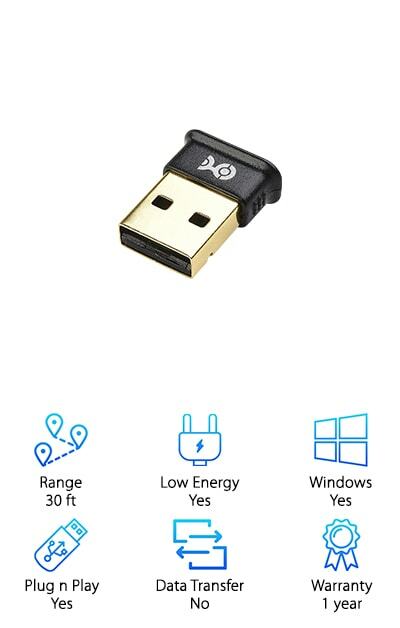 And get this, it connects at speeds of up to 3 Mbps! While this is the most advanced Bluetooth technology available, it still works with older Bluetooth equipment, too. All you have to do is install the included drivers, plug it in, and it’s ready to connect your Windows laptop or PC to your devices. Plus, it’s really compact and you can even leave it in your laptop during travel. And get this: it can support up to 6 different devices at the same time. We told you there was a lot to love. 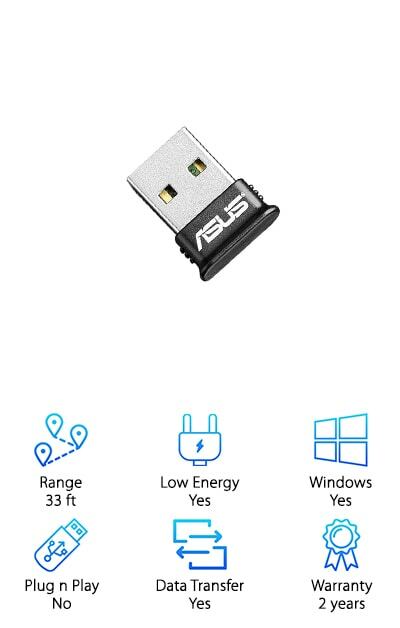 For a best cheap Bluetooth adapter, check out the ASUS USB Adapter. It’s the newest stuff, Bluetooth 4.0, the low energy technology that reduces power consumption. Believe it or not, some batteries can last for years with 4.0. But don’t worry, just because it’s the newest thing going doesn’t mean it won’t work with your older devices. It works just as well with previous versions of Bluetooth, too. It supports data transfer over 33 feet at 3 Mbps and works with most versions of Windows. That’s not all, it’s also very small and doesn’t stick out of your laptop very far. It comes with a CD that includes all the drivers you need for quick and easy installation. It’s not quite plug and play, but it’s close. Another really good USB Bluetooth adapter comes from Onvian. In open spaces, it can transmit data at up to 3Mbps at a distance of 33 feet. And get this, the price? It’s definitely a bargain. This device was designed for Windows. With newer versions, you can just plug and play. And get this, you can also use it with the Xbox One S Controller. Windows 7 and older will require you to install some drivers before you connect a device. Don’t worry, they’re easy to get and can be installed in minutes. Even though this is such a bargain, it’s still equipped with the newest low energy technology. Another thing that’s great about this one is the sound quality. And, you can even transfer files, audio, and voice easily and wirelessly. 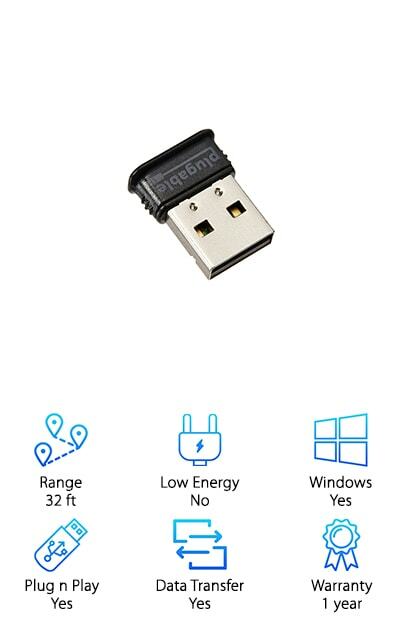 This top rated USB Bluetooth adapter from QOFOWIN is a little different but if you always wanted to use Bluetooth in your car, you’re going to love this. Here’s the deal: you need an audio out or headphone jack for this to work. What it does is make whatever you’re plugging it into receptive to Bluetooth. This is perfect for older cars or cars that aren’t equipped with Bluetooth. If your car has a USB port, just plug this in then connect it to the audio jack and you’ll be able to play music from your phone wirelessly. If you don’t have a USB port in your car, all you have to do is get an adapter. It will plug right into your car’s cigarette lighter so you can plug the USB adapter right in. The H. Guard Bluetooth USB Adapter is one of the best Bluetooth USB adapters if you need to send your signal a farther distance. It has an impressive range of 165 feet. This plug and play device is compatible with Windows, though if you have Windows 7 or older, you’ll need to install some drivers. One of the cool things about this one is it works with more than one device at the same time. You can use a mouse, keyboard, and headset all at the same time. That’s not all, this device also uses Bluetooth 4.0 which uses less energy and extends battery life. And get this: it has security settings in place so you don’t have to worry about hackers getting into your information through this connection. Last up in our best Bluetooth USB dongle for PC top ten list is this one from Cable Matters. If you have an older computer or a newer computer that’s Bluetooth doesn’t work anymore, this is a great choice. One of the things that we really liked about this one is that you can pair up to 7 devices at the same time. Installation is simple, they include a CD that contains all the drivers you need. Or, if you’d rather, they’re also available for download. It’s plug and play with certain programs, too, like Raspberry Pi Zero and 2 with Raspbian if you’re into Linux systems. One more thing, the Cable Matters USB Adapter is equipped with Bluetooth 4.0. It uses a low amount of energy and helps batteries last.